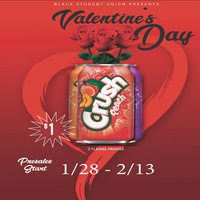 The Black Student Union is selling Crush pop cans with a rose and a personalized note for that special someone, a friend or to shoot your shot for Valentine’s Day! Choose from three flavors of Crush. Each can is $1 and can be purchased in the Orr Center Atrium from noon-2 p.m. January 28 until February 13. Money raised will be used by the Black Student Union to organize additional events and raise awareness for the organization. Cans must be picked up on Wednesday, February 13 from 4-6 p.m. in the Multicultural Center multipurpose room by the Traditions Lounge in the UC.